I found something new to play with! Speedball Elegant Writer and here is the video that made me curious. I practiced a while and decided this butterfly would be fun to use with the pen. 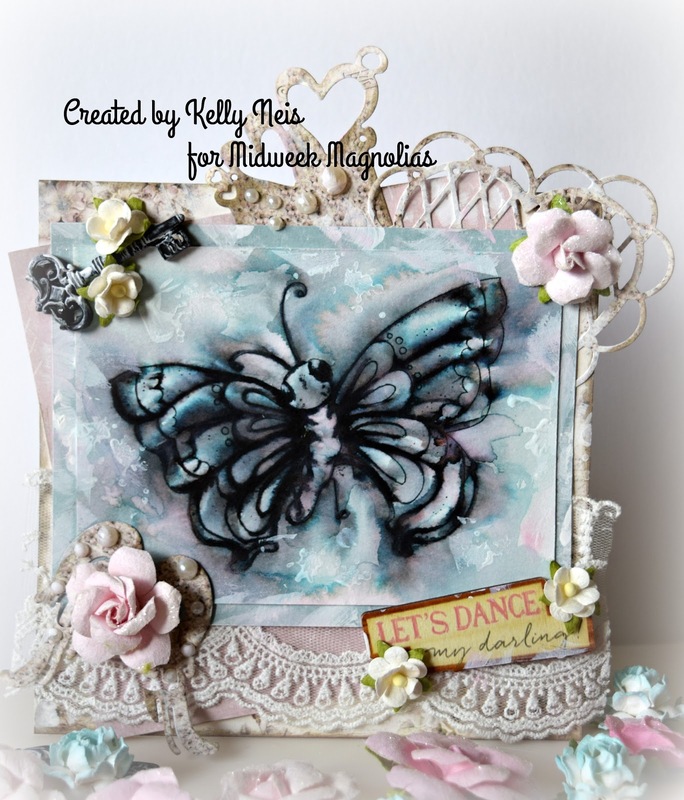 I love the dimension it gave it and the colors are perfect for this project so I made a canvas and matching card using the Elegant Writer pen. After I stamped my Magnolia Butterfly onto watercolor paper, I outlined the entire butterfly with the pen first. Then I took a watercolor paint brush to make the lines wet and then the black spreads out with some some color. If you want more color then dab it with a dry paper towel and it will turn more pink or blue, then get the line wet again. Eventually the pen lines dry and you can no longer spread the ink. By using the water from the brush I was able to spread the colors to the edges of the paper for a background. 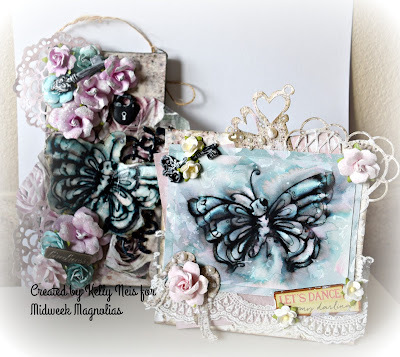 I dabbed a bit of white paint onto a stamp and stamped a bit around the background and card. The canvas background is Pion paper with a napkin from my friend. They are available at Live and Love Crafts in various designs. 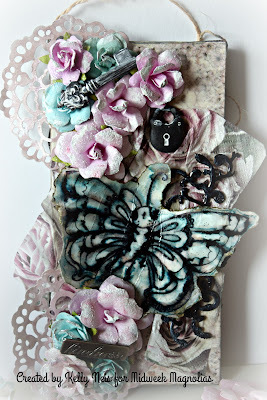 I made 2 doilies from a die and the Pion paper then added the flowers and embellishments. 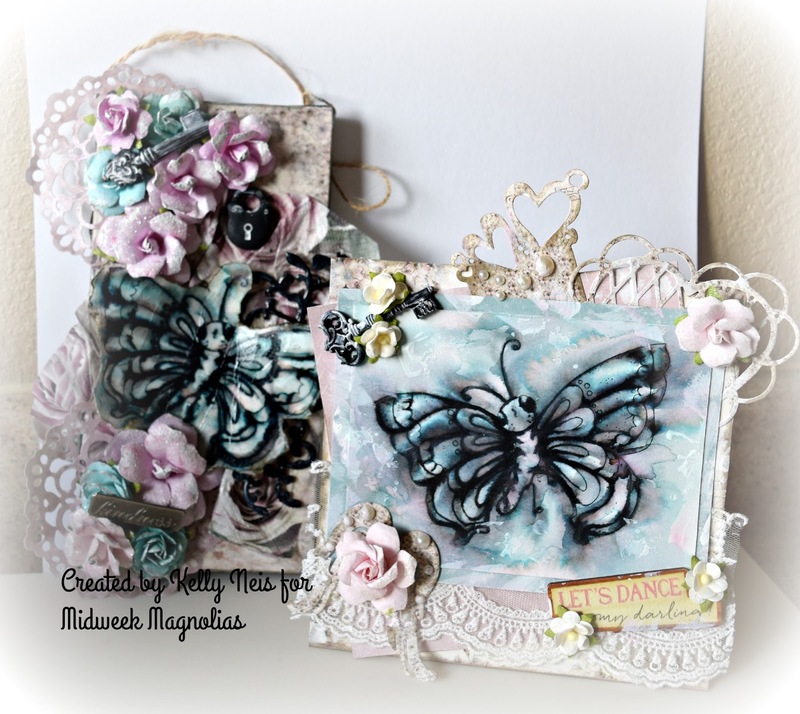 The coordinating card with another large Butterfly from Magnolia. It is currently out of stock at Magnolia-licious but if you email Diana she would order it for you. I used the same papers and adorned it similar to the canvas. It would be great seeing my friends join us and to win a prize! Awesome! For more inspiration, please go to the challenge blog and see the gorgeous things my teams did. Oh Wow! this is SO pretty Kelly… Love the pink and blue combo… those butterflies look awesome… looks like a fab technique! It's a bug's life until you get squashed! As always, your card is gorgeous! Kelly I hate to be the one to break it to you but your card is An Embellishment! This is so elegant, Kelly! I just love it to bits! Awesome Kelly! 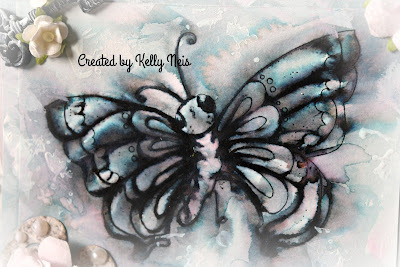 your butterfly is really beautiful, gorgeous watercolor! Hugs.